The store will close at 6 pm as usual, though attending students can still make purchases. We’ll have a healthy dinner and a delicious dessert or two, followed by lots of knitting and stitching time and all the help and instruction you want. It’s a class so our normal class rules apply and you’ll get credit for it. The fee is $25 and advance reservations are required by the Wednesday before. Yarn must have been purchased from Knit One, Stitch Too. There will be a surprise or two during the evening as well. Future dates for this year will be announced as they are scheduled. Call the store for more information. We’ll have a delicious dessert or two, followed by lots of knitting and stitching time and all the help and instruction you want. You must provide your own dinner arrangements. It’s a class so our normal class rules apply and you’ll get credit for it. The fee is $10 and advance reservations are required the Wednesday before. Yarn must have been purchased from Knit One, Stitch Too. Future 2019 dates for this year will be March 15th, April 19th, May 17th. Call the store for more information. 2013 Mardi Gras. Mark your calender for this year! Our favorite event of the year has arrived again, and the first of the king cakes is almost ready. Pull all of your beads, doubloons, masks, and costumes out from that safe place for this year! Our 2019 MARDI GRAS SALE is Friday March 3rd, Saturday March 4th, Monday March 6th, and Tuesday March 7th! And don’t forget, we’ll have wild music, wonderful king cake (with a prize in each), great fun, and the best prices ever. To get the biggest discount, you have to be just as wild and crazy as we are! If you wear purple, green, or gold, you’ll get 1% off, or 5% if you wear all three. If you know a Mardi Gras song, you’ll have an additional 3% off. A Mardi Gras slogan is worth another 3% off. Real Mardi Gras beads are worth 3%, and a real Mardi Gras doubloon is worth 5% (we gave you beads and doubloons in past years, so dig them out and bring them in). A real Zulu coconut that Betsy can keep is worth 10%. 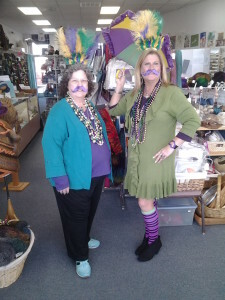 Any wild and crazy (and legal) Mardi Gras attire will be worth extra percentage off your prices, so have fun getting wild and crazy and save money, too! Mark your calender’s for next September for our 11th annual Yarn Crawl!